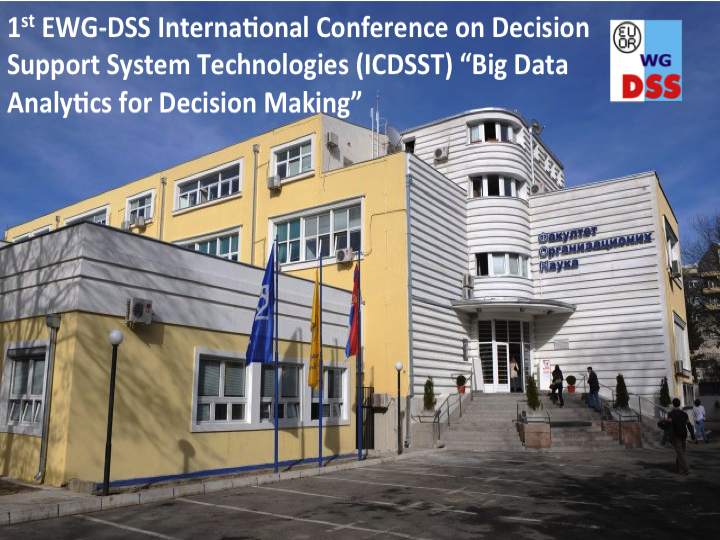 The ICDSST 2015 – INTERNATIONAL CONFERENCE on DECISION SUPPORT SYSTEMS TECHNOLOGY – is organised by the EURO Working Groups on Decision Support Systems (EWG-DSS) and sponsored by EURO – the Association of European Operational Research Societies. A full commercial one-year-license of the simulator FlexSim, sponsored by FlexSim Software Products, US, www.flexsim.com. 2 Licenses of Arena (latest Academic Version),sponsored by Rockwell Automation, http://www.ArenaSimulation.com. A License of ExtendSim, sponsored by Imagine That Inc., US, www.ExtendSim.com.